Push notifications are an important part of the mobile experience. Users have grown accustomed to having push notifications be a part of virtually every app that they use. The Android Programmable Chat SDK is built to have push notifications integrated into it. 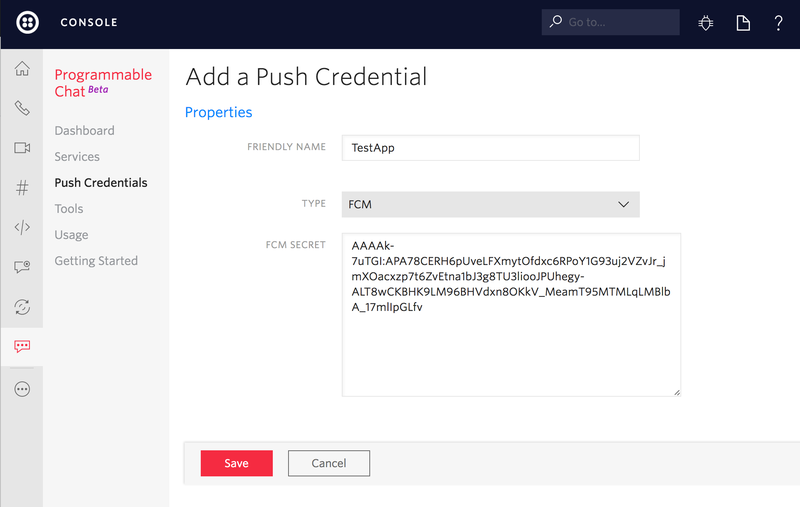 Managing your push credentials is necessary as your registration token is required for the Chat SDK to be able to send any notifications through GCM or FCM. Let's go through the process of managing your push credentials. The GCM interface is declared deprecated by Google and could be removed by them at any moment. To ensure future compatibility consider using FCM in your products. IMPORTANT: The default enabled flag for new Service instances for all Push Notifications is false. This means that Push will be disabled until you explicitly enable it. Follow this guide to do so. Both GCM and FCM services look for a file called google-services.json in your Android app to identify push configuration details. Google provides an easy-to-use web interface for generating this file that you can find here. For FCM you can do the same from the Firebase Console. Copy the google-services.json file you download in the step below into the app/ directory of your Android Studio project. Once you've gone through and entered your app credentials, you can download the generated file to your desktop. Save the API Key that is displayed on the last page, as we're going to use it later on. Android Studio uses Gradle to parse your credentials from the 'google-services.json' file. Your app has 2 build.gradle files, a project-level one (global) and an app-level one (inside the 'app/' directory). Note: be sure to use the com.android.tools.build:gradle:2.1.2 build plugin with gradle, not com.android.tools.build:gradle-experimental:0.7.0. The latter will not work with google-services plugin and will not process your JSON file. If you need to use gradle-experimental, you will have to implement JSON parsing yourself or hard code the Sender ID. Use version 10.2.0 or later, as the earlier ones will not work. The Application Manifest file defines critical information like permissions and dependency versions for the Android app before it runs any code. You'll need to add a few lines to configure your app to communicate with Google push service. Add the C2D_MESSAGE permission to prevent other Android apps from registering and receiving your messages. You'll also want to add the GcmListenerService to handle messaging related events. Example implementation can be seen here. Once you've done that, create a service that extends InstanceIDListenerService to handle registration tokens. Example implementation can be seen here. Add a service to handle subscriptions to GCM. See here for example implementation. You'll also want to add the FCMListenerService to handle events related to messaging. Example implementation can be seen here. Once you've done that, create a service that extends InstanceIDListenerService to handle registration tokens. An example implementation can be seen here. Next, add a service to handle subscriptions to FCM. See here for example implementation. Now that we have our app configured to receive push notifications let's upload our API Key by creating a Credential resource. Check out this page to generate a credential SID using the API key. From the drop-down, choose GCM and paste in the key. Depending on whether you use GCM or FCM (you cannot use both at the same time), you will need to call correct ChatClient API methods - registerGCMToken and unregisterGCMToken for GCM, or registerFCMToken and unregisterFCMToken for FCM. See the documentation for details. Nice! That's all we need to make sure the client has access to your registration token!